RIM launches Mobile BlackBerry information site | BlackBerry Blast! 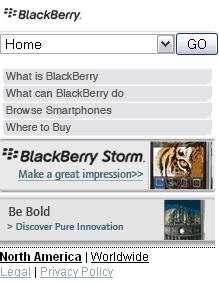 RIM has just launched their own mobile web site to provide BlackBerry users with the latest BlackBerry information. BlackBerry.Mobi will contain RIM news and information formatted for your BlackBerry browser. Simply point your BlackBerry Browser to BlackBerry.mobi and you're all set.